With designer bathrooms quickly becoming a highly lusted-after interior design trend, the world’s most luxurious hotels have unveiled their own bath time eye candy. Imagine sinking into some bubbles looking out across an azure sea, or enjoying a soak with a chilled glass of champagne over a cityscape? 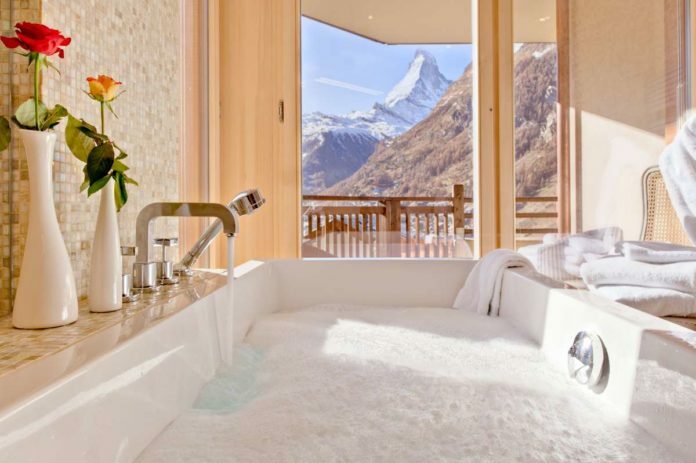 Look no further as we round up our top ten hotel baths with a view. 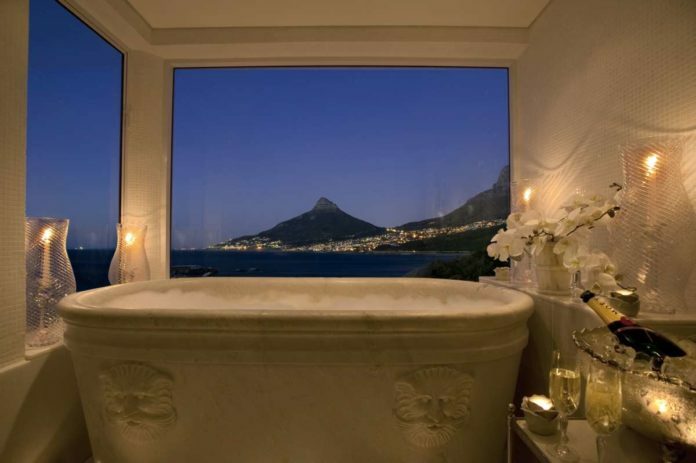 Forget whale watching from the hotel’s Leopard Bar Terrace and ignore the private cinema –Twelve Apostles Hotel & Spa is all about the bath-time views. The hotel is flanked by The Twelve Apostles Mountain Range and the majestic Table Mountain, proving the most gob-smacking vistas of the UNESCO Cape Floral Region World Heritage Site as you soak in the tub. Hong Kong is famed for its dramatic skyline, boasting an impressive array of skyscrapers, surrounding mountains, beach-fringed coastlines and Victoria Harbour, which separates Hong Kong Island and Kowloon. The really city bursts to life in the evenings though, as the imposing buildings light up in an array of colours and the harbour plays host to the daily Symphony of Lights. 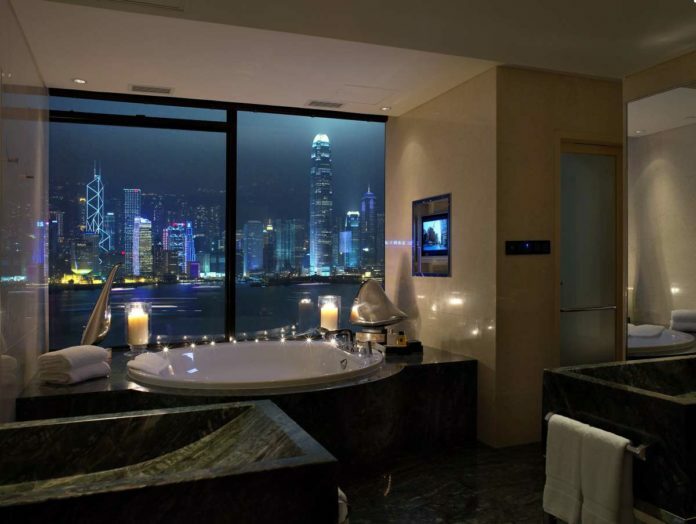 Where better to watch than from a vast, circular bath at theInterContinental hotel? Fits two people comfortably – a perfect setting to share a bottle of champagne or two. Keen skiers find it hard to tear themselves away from the powder slopes and the stunning mountain views at the best of times. If reluctantly huddling up in a wooden chalet at the end of each day isn’t your thing, then staying in Firefly Collection’s Chalet Grace may be just the tonic. Facing across the valley, Zermatt’s hidden gem offers heart-stopping and uninterrupted views from the deluxe bathroom – the perfect place to thaw out. 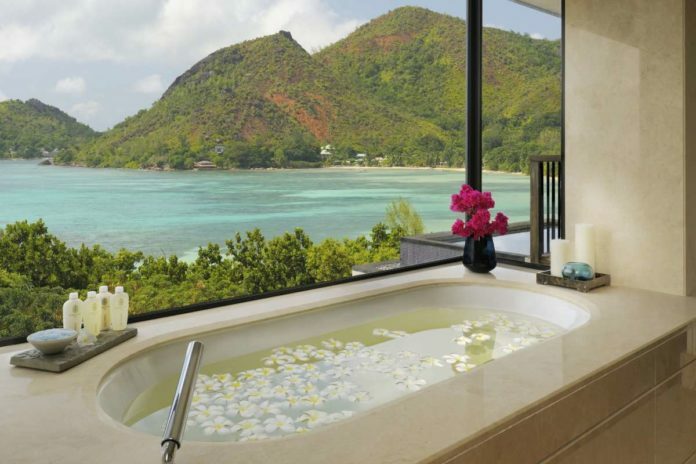 With the nearby Anse Lazio beach often referred to as one of the most beautiful beaches in the world, you’d be hard-pressed to find a bath with a better sandy view than from Raffles Praslin in the Seychelles. Each villa features a carefully placed bath to maximise star gazing at night or to drink in the lush green hills, white powder beach and opal-hued ocean during the day. 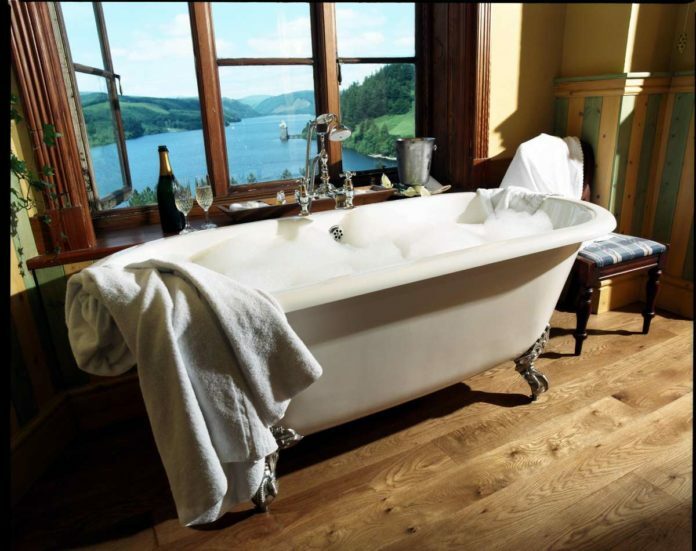 Part of Welsh Rarebits, a collection of hotels with distinction, Lake Vyrnwy Hotel & Spa surprises and delights with a view that wouldn’t look out of place in the middle of New Zealand. If there was ever a reason to visit Wales, it’s this. The bath with a view overlooks a stunning, mountain-ringed lake; there seriously is no better place to shrivel like a prune in the UK. 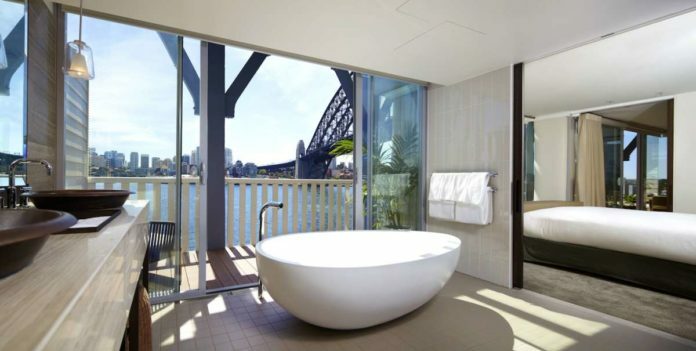 Pier One Sydney Harbour is a stunning boutique hotel that offers bath views directly over Sydney Harbour Bridge. Epitomising ‘Exactly Like Nothing Else,’ Autograph Collection’s tagline, the hotel is a shining example of Marriott’s group of boutique, stylish properties. Book the harbour view balcony suite and enjoy a soak overlooking Sydney and the famed landmark bridge – the perfect way to start a trip down under. 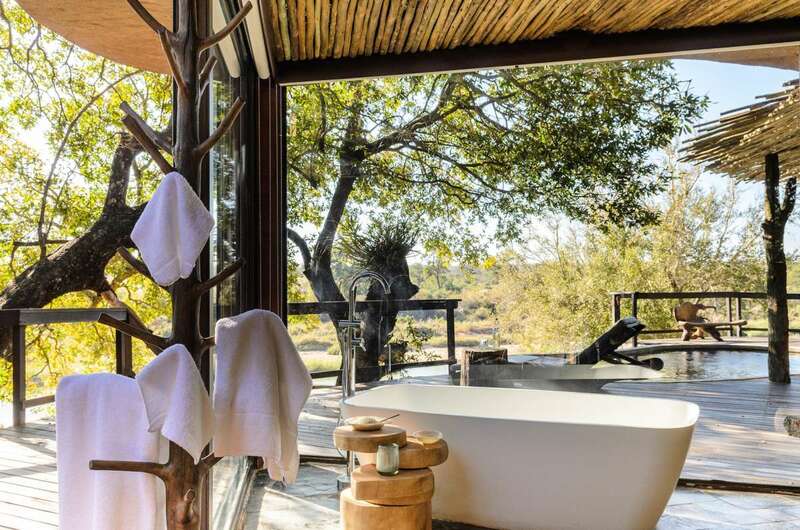 Did you know you can bathe in an alfresco tub whilst watching elephants enjoying some light refreshment? We didn’t either until we happened upon this South African 12 bedroom lodge, set in a wildlife reserve. Soak away your stresses overlooking the Sand River, and you might be lucky enough to spot herds of elephants drinking at its banks. There are few places better than the Maldives when it comes to ocean views, with most over-water villas on the collection of islands offering unbeatable vistas of the Indian Ocean as far as the eye can see. 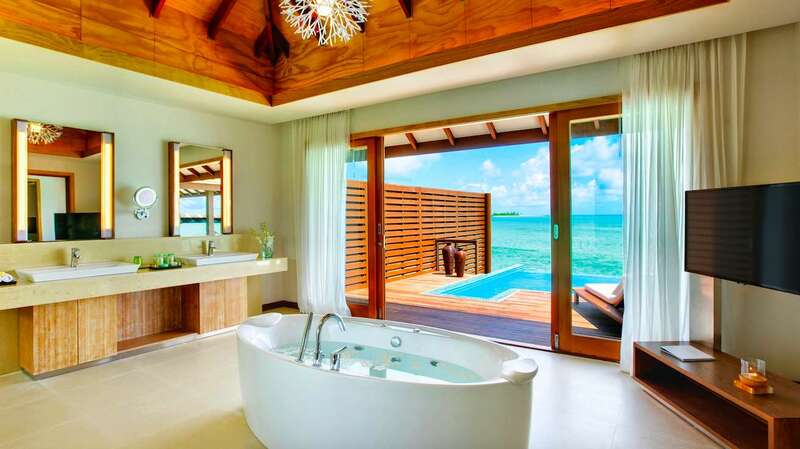 Hideaway Beach Resort & Spa boasts a vast number of these following a recent $50 million renovation, and also offers a personalised butler service. 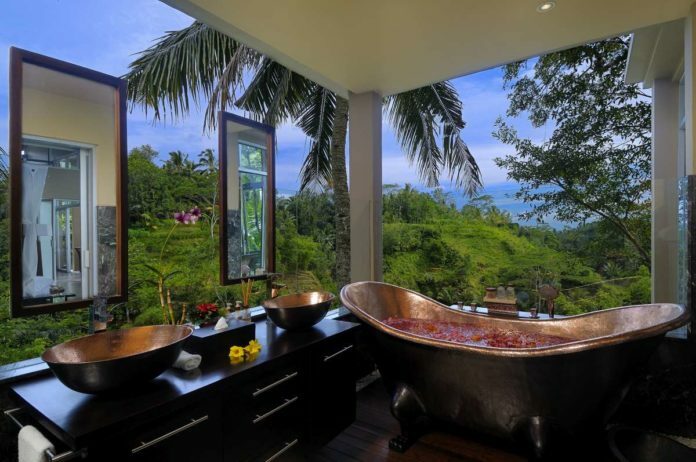 This popular honeymoon destination is the perfect place to order a bottle of Bolly to enjoy in your rose petal bath. There’s arguably no better skyline than that of New York, and Mandarin Oriental‘s stateside offering boasts unparalleled bird’s eye views of Manhattan. Book the Oriental suite to enjoy a bath not only with stunning views of the Big Apple shimmering below you, but also of the city’s much loved greenery. There’s no better place to immerse yourself in bubbles in the city that never sleeps. Nestled in the lush Bali jungle, Villa Kalisha sits almost suspended about a steep gorge, overlooking show-stopping vegetation and the volcanoes of Bali. The dramatic open-air bathroom opens up in three directions, with tropical vistas in your eye line which ever way you look from your indulgent copper tub. You will never feel further from home or civilisation than you do here – perfect for the ultimate relaxing soak.